Every schoolboy knows the story of the Battle of Agincourt, where a small, sick, starving English army under King Henry V won a stirring victory over a huge French host, all on St. Crispin’s Day. We few, we brave, we band of brothers, and all that. 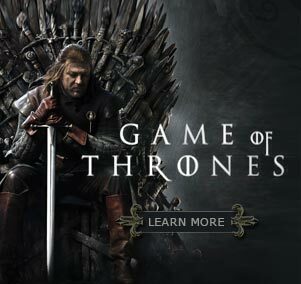 The English lords and knights performed nobly, no doubt, but the battle was won by the longbowmen, who stood behind their sharpened stakes and loosed hundreds of arrows at the flower of French chivalry as the knights advanced through the mud. All that you learned in school, no doubt. Most likely, though, Mrs. Grundy left out the details of the sickness afflicting King Henry’s army: dysentery, accompanied by the runs. It’s hard to kill French knights when you are squatting in the bushes with your breeches round your ankles, so many of the longbowmen simply took off their pants whilst awaiting the French charge. Come the battle, they shot and shat, shot and shat, shot and shat. Somehow that gets left out of most accounts of the battle, but fortunately the toy soldier makers have leapt in where historians fear to tread. 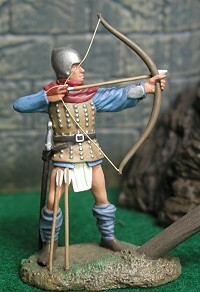 From Forward March comes this hero of Agincourt, from the bare-cheeked band of brothers. No medieval court would have been complete without a jester, a fool in motley who often enjoyed the freedom to say things no courtier would dare… so long as he was amusing. 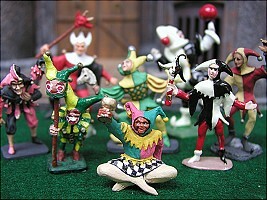 Fools are fixtures in the world of medieval toy soldiers as well. Here are some from my collection. The motley crew on the right (heh heh) includes figures by Tiffany Soldiers, Bob Hornung, Starlux of France, Rosedale Miniatures, Sanderson, Al Charles, Ritter C.B. von Krauthauser, Imrie-Risely, and others. On the left are a couple of fine fools from Mokarex, a French coffee company that gave away great plastic figures in cans of java. 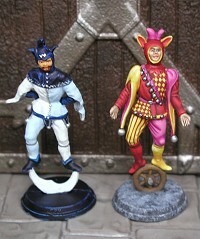 I painted the “moon fool” myself, while the spectacular motley on the “wheel fool” was done by Dave Gulczynski of WarPaint Studio. I have been known to paint a few figures from time to time, usually while “watching” television. 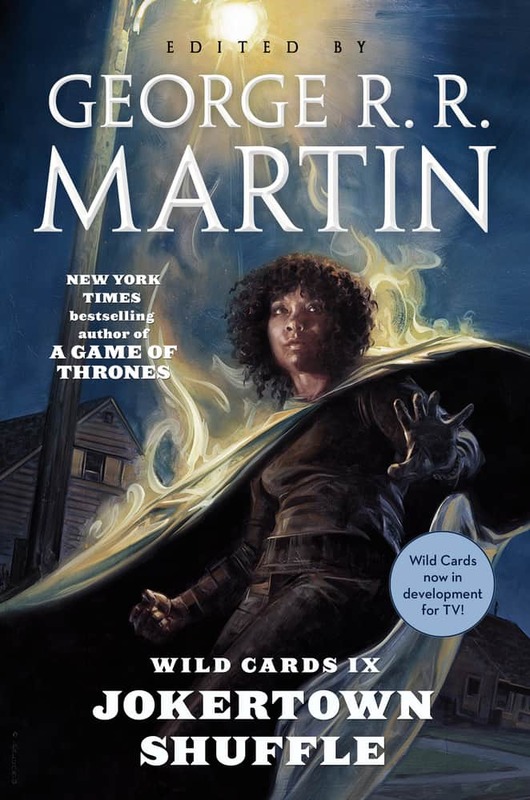 (It’s odd how many TV shows don’t need to be seen to be understood). My skills are no match for any of the other painters whose figures are shown here, but I enjoy it. 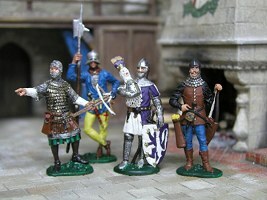 Here are some figures I painted myself. The marvelously detailed pewter castings (by Eduard Kasintzev of the Ukraine) surely deserved better paintwork than I was capable of giving them… but I am a lot better than I used to be, for what it’s worth. Sooner or later every toy soldier collector stumbles on some figures that he doesn’t recognize, and can’t find in any of his reference books. 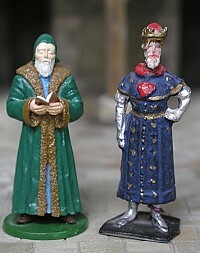 Here are a couple of my own “mystery figures,” a cleric and a king. I picked up the cleric on ebay, and found the king on a dusty shelf in a Denver antiques mall. I have no idea who made these or where they came from… but maybe one of the visitors to this site will solve the mystery some day. 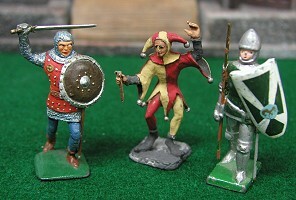 And here are three more mystery figures I’ve stumbled on, with no clue as to who might have made them, or when. Any information would be welcomed. Another puzzlement. The cloak on this mystery king is made of folded sheet metal in a manner that was characteristic of Freddie Ping, but the metal is much harder than the soft lead that Ping typically used. Also, the cut glass “jewel” that tops the king’s staff is more typical of the unpainted pewter figures sold in gift shops than anything produced by a genuine toy soldier guy. 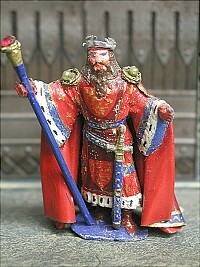 Still, he’s a charming little monarch in his way, and I’d love to know who made him. 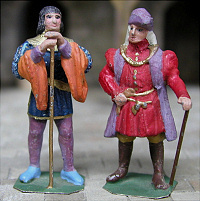 The most recent mystery men to become a part of my collection are these two medieval noblemen that I picked up at the Old Toy Soldier Show in Chicago. Their bases are characteristic of the work of Charles Stadden, but the figures themselves are not. They bear no maker’s marks or signatures, and I’ve never seen them in any of my reference books. If any of you know who might have made them and when, drop me an email.